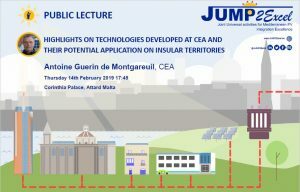 As the local coordinators of the European Project JUMP2Excel, we are delighted to announce that Mr Antoine Guerin de Montgareuil, a research engineer at the French Alternative Energies and Atomic Energy Commission (CEA) will be delivering a public lecture on Highlights On Technologies Developed at CEA and their Potential Application on Insular Territories. The lecture will be held on Thursday 14th February 2019 at 17:45 at the Corinthia Palace Hotel, Attard. Antoine Guerin de Montgareuil graduated from the Paris Mining School ENSMP in 1977 and the MSc in Computer Science from Nice University in 1986. 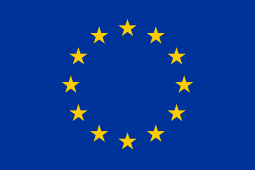 He currently works at the Centre d’Etudes de Cadarache, Atomic Energy and Alternative Energies Commission. He is an expert in the measurement and the modelling of the performance of photovoltaics, from the solar resource to the energy counter of power plants. This event is being organised in collaboration with the Malta Group of Professional Engineering Institutions (MGPEI) and the Chamber of Engineers. The event is free of charge and will be live-streamed on the JUMP2Excel social media platforms. Electronic Certificates of Attendance will be provided after the event.